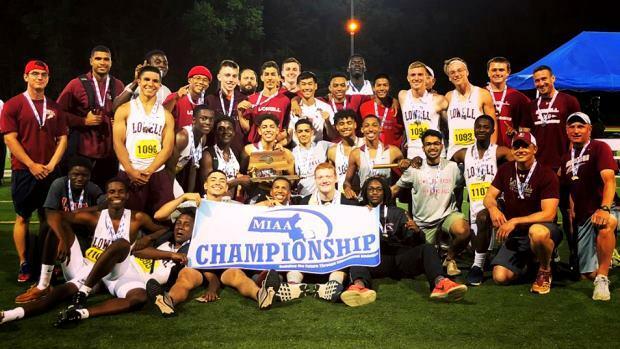 FITCHBURG, Mass.--Massachusetts's top track and field athletes collectively eschewed humid and visibly uncomfortable conditions by registering a spate of outstanding performances at the MIAA All-State Track and Field Outdoor Championships at Fitchburg State University. Among the newly minted state record holders was Sharon senior Shira Stoller, who highlighted the field event portion of the meet with an impressive result in the javelin. Stoller, drove the implement to a mark of 156-10 (47.80m), in erasing the previous standard set by Katherine Nelson of Wachusett Regional High School in 1980. Nelson's mark, achieved with the 'old style' javelin, bested the meet record (149.08) of Lunenburg's Laura Stern in June 2008. The overall team titles went to Wellesley on the girls' side and Lowell on the boys. For Lowell, it was its first-ever team title. In the girls' mile, Grace Connolly (Natick HS) hit the line in 4:51.96 in notching the win. Second went to freshman Emma Kerimo of Concord-Carlisle in 5:03.57. "I was hoping to break 4:50 but that's what nationals are for," said Connolly who spent a significant portion of her run up to the meet in a rehab mode for an earlier injury. "I wished I would have run faster but I'm really not the best runner in the heat; mentally, I was a bit distraught thinking about the heat but I'm happy with the way I executed and overall, I'm happy with the way the race went." At 800m, Acton-Boxborough senior Samantha Friborg was on point; coming home in 2:07.27 for the win. "I'm pleased that I was able to compete here unlike last year," said Friborg who was unable to toe the line last spring as a result of a late-season injury. "I'm psyched feel happy to be able to get here this year while being healthy and running well." Karina Shepard of Dracut (2014) remains the current meet record holder in the event at 2:07.14; a mark, well within Friborg's wheelhouse. "I was hoping to run under 2:07 but there are no complaints, I was able to have a good day competing against great competition." Kate Mitchell of Lynfield followed Friborg to the line in 2:11.30. On the boys' side of the distance disciplines, Arlington's Ryan Oosting collected the win in a competitive mile, clocking 4:14.09 in the process. Second, went to Jason Dolan (Westford Academy) in 4:16.18 while Rishabh Prakash of Burlington got up for third at 4:16.64. Oosting doubled up on the podium with a strong effort in the two-mile run, winning in 9:06.17. "I was able to race these guys a few times over the season and feel comfortable around them, " said Oosting of the pressures of competing at a high level under not-so-ideal conditions. "I think today it came down to the confidence I have in myself; not an arrogance, but just believing that every time I go out on the track I can try my best." Andrew Mah (Newton North) and Saint John's Prep's Tristan Shelgren collected the second and third place slots in the 2 Mile; the former breaking the finish line plane in 9:13.32 to Shelgren's 9:20.36. Junior Sophia Jacobs-Townsley of Amherst-Pelham garnered the girls 2 Mile in 10:49.67 Runner-up went to Julia Palin of Norton HS who also dipped below the 11-minute mark at 10:57.58.